A factory reset or hard reset, allows you to wipe the entire contents of your iPhone or iPad. This is useful if your iPhone or iPad is experiencing an irreparable error, or you want to factory reset your device's because you want to sell it. Here is a quick guide to reset iOS. 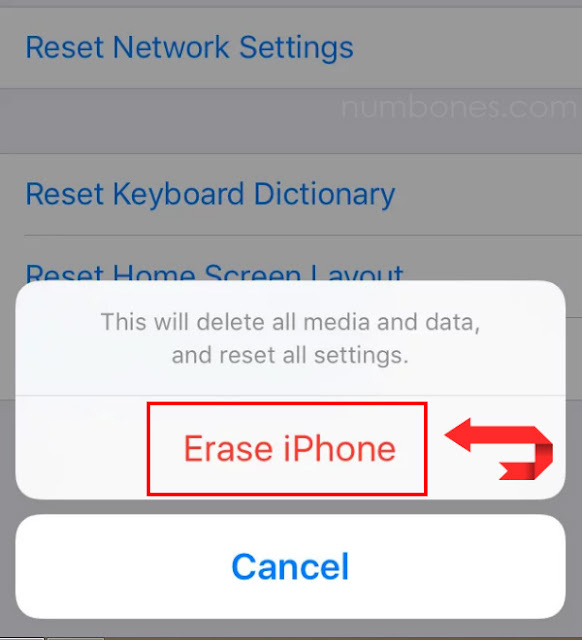 Whether you want to reset because you want to sell your iPhone or take it for repair, you must reset it to delete all your accounts and delete all your content. 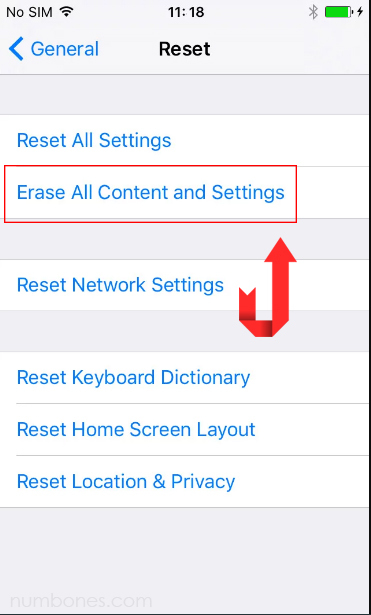 For how to reset the factory on your iPhone or iPad, you can do it in Settings => General => Reset => Erase all content and settings. Then you will be asked to enter your passcode and Apple ID as verification before starting the process. 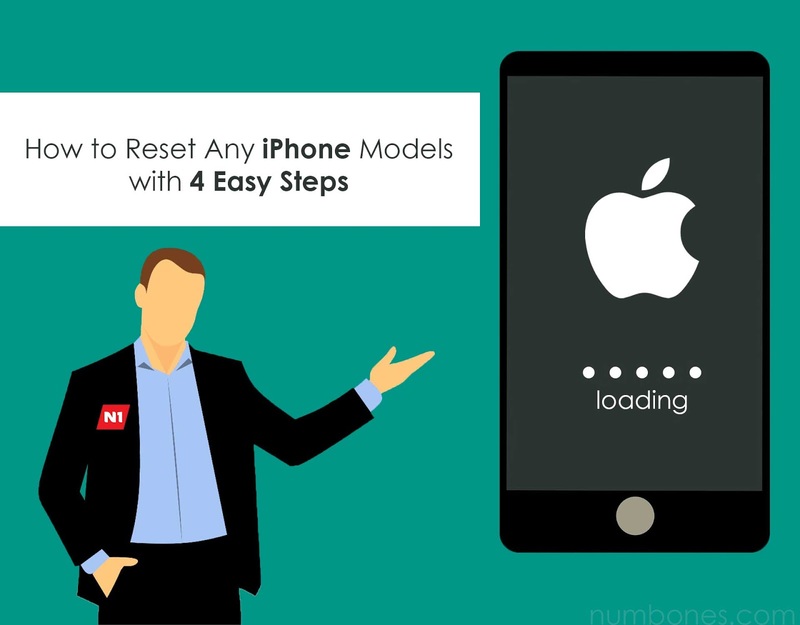 And the method to hard reset or factory reset for iPhone or iPad that numbones.com will share can be used by all iPhone models and all iOS versions. Even if you want to do a hard reset or factory reset on iPhone 4s, iPhone 5, iPhone 6, iPhone 7, iPhone 8, or iPhone X, you don't need to worry about the different models or differences in their iOS versions. Because basically the way to reset all iPhone models is almost the same. If there is a problem when your phone is locked, and what you only want is just turn it back on but there is no button that works. To solve this problem, you can do a soft reset to your iPhone or iPad. To do this, hold the power button and home button at the same time until your device turns off, then you will see the Apple logo. Then release the button that you pressed, and your iPhone or iPad will return back to normal. There are times when you might want to reset your device not because you want to give it but because it's being played back. Even if you use iCloud, before starting reset, it would be better if you make a full backup by connecting iPad or iPhone to your computer , because resetting your iPhone or iPad will erase all data that is on your device. After you connect your device to your computer, then unlock it, wait until it appears on iTunes, and then click on the left panel. That will open the Summary screen, where you will see the Backup section. To start backing up, just click the Back Up Now button. And if you want all of your passwords to be saved, just check the “Encrypt iPhone” backup box. After you have finished backing up your smartphone, you can start the reset process. Also remember to remove your SIM card before you start resetting your iPhone or iPad, because the SIM card might have information that stored on it, and you might want to continue using it on a another smartphone. Because in the process of resetting your iPhone or iPad, it's likely that all data on your SIM card will also be erased. Depending on the iOS version you are using, the display might look a little different from what you see here. But don't worry, the names and locations of all the menus are roughly the same, and everything looks the same on the iPad. 1. Turn on your device first, then go to "Settings", then tap "General". Scroll down until you see the "Reset" menu. 2. Second, Tap "Delete All Content and Settings". At this steps, it depends on your settings, whether you have set a “Passcode” or “Restriction Passcode” before. If so, you may need to enter the code or password to be able to delete and reset your iPhone or iPad. Because there is no way to reset your device unless you enter the code. 3. Third, you will be asked to enter your Apple ID password. This is so that all of your accounts that linked to your device can be completely deleted, and the "Find My iPhone" feature can be turned off. Because if you only restore your iPhone through iTunes, you will still be asked to enter your Apple ID and password when rebooting. Resetting using our method here will prevent the iPhone from requesting an Apple ID again when restarting. 4. Last, after you enter your Apple ID and password, the reset process will run. And this process can take one or two minutes, but it can also be more than that, because it depends on how fast your iPhone is performing. After the reset is complete, you will see a welcome screen asking you to move to continue. It means that the reset process was successful, and your iPhone or iPad is ready to be sold or brought to the Apple Store for repair. That was the 4 simple ways to reset the iPhone. You could say it was easy, because it only needed 4 steps. And the time needed is also short, only takes about 5-10 minutes. 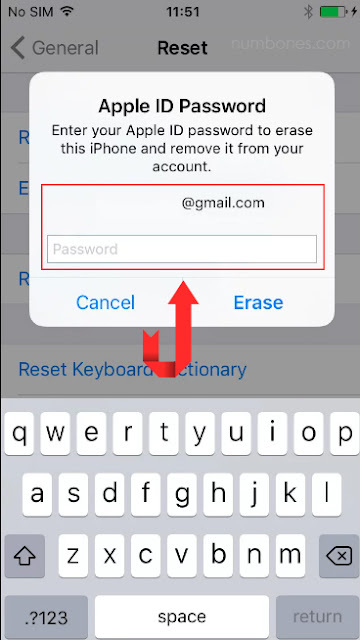 All you need to remember, and the most important thing needed to reset your iPhone is an Apple ID and password. If you remember those 2 things, then you can reset without any obstacles. And of course, you can’t reset your iPhone withoud passcode and computer, because you need computer to back up all of your iPhone data. Apart from how to reset the iPhone that I explained here, there are still many other ways. I've seen someone post about how to factory reset iPhone without a password, reset it with or without iTunes, and reset it without an Apple ID. But I can't be sure that the method they share is "legal" or not. If anyone feels unclear about how to reset any iPhone models, feel free to ask in the comments section. Thank You! 0 Response to "How to Reset Any iPhone Models with 4 Easy Steps"